Your body’s two largest joints are found in the middle of your legs. Not only are your knees vital to walking, running, standing, and jumping, they are essential to just about every movement you perform over the course of the day. That is also why the knees are some of the most commonly injured joints in the entire body. What Can Causes Sudden Knee Pain? How do I Relieve Knee Pain at Home? Take a PDF version of this article "to go" and read it at your convenience. Every joint in your body consists of three elements – bones, ligaments that attach the bones to each other and tendons that attach the muscles of the body to the bone. Regardless of where the joint is located, from the smallest version in your pinkie toe to the large joints in your body like the hips and knees, they are all put together using the same fundamental mechanics. The differences come into play with the type of bone that is connecting to another bone. For instance, shoulder joints are known as ball and socket joints because the head of the humerus, your main arm bone, fits into the cup of your scapula or shoulder blade. Since they are among the largest joints in the body, your knees are also very complex. In order to support your weight moving forward and backward, and somewhat side to side, the bones, ligaments, and tendons must be able to move together perfectly. Unlike your shoulders or hips, your knees are not ball and socket joints, where the head of one bone fits into the socket of another. Instead, they are compound, modified hinge joints where three leg bones come together. Your tibia (shinbone), femur (the thigh bone) and patella (kneecap) come together, attached by strong, stringy attachments called tendons and ligaments. Ligaments connect one bone to another while tendons connect muscles to bone. These connections make it possible for you to bend your knee, extend your leg and move your leg slightly from right to left or left to right. Damage to one or more muscle, bone, tendon, or ligament, or to the soft tissues surrounding any of these structures can result in a pain that limits your mobility. Because of the knee joint’s complexity, it is prone to damage from a variety of sources. Osteoarthritis – Also called degenerative arthritis, osteoarthritis affects the cartilage in joints. It is also one of the most common chronic joint condition in the US. More about that later. 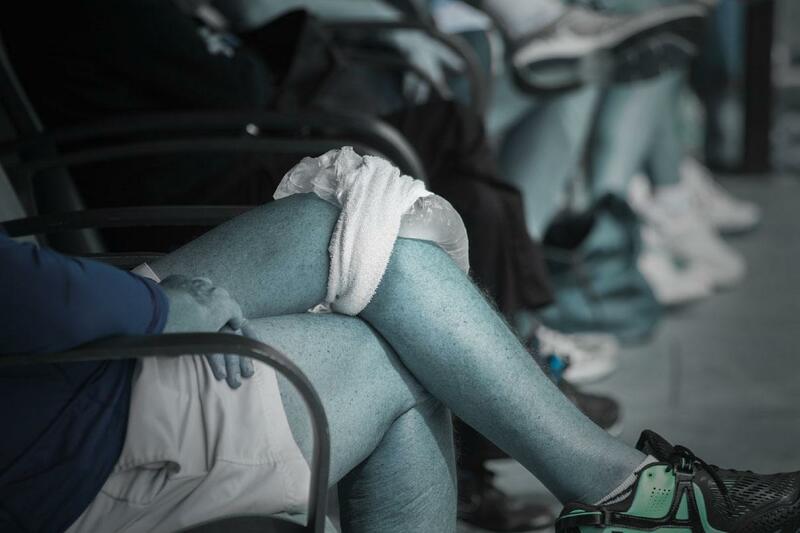 Injury – Sudden knee pain can generally be traced back to a single event, accident or injury. These injuries are especially common in athletes and significantly overweight people. Overuse– Just like any joints in the body, knees are prone to overuse injuries. In fact, 42 percent of overuse injuries happen to the knee. Disease– Autoimmune diseases like rheumatoid arthritis and multiple sclerosis can also cause joint pain, especially in weight bearing joints like the hips and knees. Arthritis is not actually a singular disease, but a classifications of diseases that affect the joints of the body. For instance, rheumatoid arthritis is an autoimmune disease where the immune system begins attacking the tissues that form the joints of the body. Osteoarthritis, on the other hand, is the deterioration of the cartilage in the joints. Cartilage is a hard, tough covering that surrounds the ends of bones. Think of cartilage like brake pads on a car. Not only does it protect the bones that make up the joints from rubbing on each other, it also prevents tendons and ligaments from slipping out of place. When there is adequate amounts of cartilage, the structure of the knee is stable and can perform any function you would like it to. Once osteoarthritis sets in, the cartilage begins to deteriorate. Instead of allowing the bones in the knee to glide the way they should and keeping the knee structure sound, three things can happen. The bone can deteriorate causing painful bone spurs that catch the tendons and ligaments, bits and pieces of the cartilage tear away, and inflammation can set in around the knee. All three cause pain every time you walk, run or even stand up. In fact, pain that cannot be traced to a certain injury, event or accident is the number one symptom of arthritis in the knee. However, this pain is often accompanied by a “grating” or “scraping” sensation. There may be mild swelling around the knee that is generally worse at the end of the day, There may even be a cracking or popping sound when the knee moves. It is believed that osteoarthritis may have a genetic component, but it also happens in people with certain risk factors. People who are overweight are more likely to develop arthritis in the knee because they put more wear and tear on their joints. The pressure we put on our knees is not a pound for pound measurement. Instead, studies have shown that for every pound of weight a person loses, they reduce the pressure on their knee by four pounds. Lose ten pounds? Reduce the pressure on your knees by 40 pounds. Likewise, osteoarthritis happens more regularly to people with chronic injury to their knees or who use their knees as a part of their work. Athletes and those with careers that require long periods of standing, lifting, squatting or running can wear away the cartilage in their knees more quickly. Even people who have had a previous surgery on the knee or previous knee injury that has healed are more prone to arthritis. Sudden knee pain falls into two broad categories – knee pain after an injury or knee pain without an injury. Bursitis – The knee has several small fluid-filled sacs that provide cushioning between the tendons and bones. When these sacs get irritated, inflamed or break, they result in a condition called bursitis. 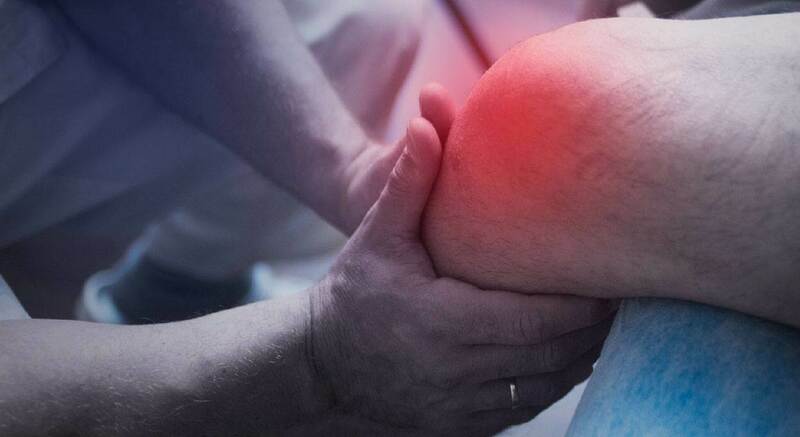 Bursitis makes the knee warm and red and can cause pain whenever the knee is moved. Bleeding in the joint – This generally only happens when taking an anticoagulant. The knee becomes warm and swells with some bruising. Gout – If your knee is hot, red and suddenly very painful, you could have gout. This form of inflammatory arthritis is the result of too much uric acid in the blood. The body begins to form crystalline structures that become suddenly very painful when they begin to affect the tendons, ligaments and bones in the body. Tendonitis – Pain between your kneecap and your shin bone may be caused by tendonitis, or inflammation of the tendon in the knee. This is most often caused by running or jumping. Sudden knee pain is more commonly associated with an injury or accident. Patellar fracture or dislocation – The patella, also known as your knee cap, is the smallest bone that makes up your knee. When this bone is forced out of place, it is known as a dislocation. Just like any bone, it can fracture or break if it is hit with enough force. Anterior Cruciate Ligament (ACL) injuries – This is one of the most common knee injuries in athletes or other people who stop and change direction suddenly. ACL injuries are also often associated with injuries to other structures of the knee such as the meniscus or cartilage. Meniscus tear – Most often when people talk about tearing the cartilage in their knee, they are actually talking about the meniscus. The meniscus is a thick cushion of cartilage that sits between your femur (thigh bone) and tibia (shin bone). There are two in each knee and these discs act as shock absorbers in the knee. However, one false move is enough to tear the meniscus and cause sudden, shooting pain in your knee. Sprains and strains – It is possible to sprain or strain a knee without causing damage that requires surgery for correction. Sprains or strains are the stretching of tendons or ligaments in a joint that temporarily weaken it, causing pain and inflammation. Knee pain is one of those symptoms that you simply cannot ignore and hope it goes away. Since the knee is vital to so many daily movements, pain, inflammation or injury can lead temporary or permanent disability very quickly. If you are experiencing knee pain, whether it has been slowly coming on or suddenly hit you like a ton of bricks, it is important to seek medical attention. Your physician or chiropractor will begin by taking a detailed medical history. They will ask you questions about your physical activity, your habits, your accident history, and your employment. They will also take your vital measurements such as your height, weight, and blood pressure to determine if there is a reason to suspect an underlying cause for your knee pain. It is important to be thorough and honest in your explanations to your medical care provider. Do not claim to exercise six days a week if you are a couch potato. This will only affect your diagnosis in the long run. Next, your medical practitioner may take a series of images of your knee. These may include x-rays, ultrasounds or Magnetic Resonance Imaging (MRI). These tests are designed to help your care provider see underneath your skin to find out if there are any obvious problems with the structure of your knee. Why the need for more than one test? X-rays will only show you the skeletal system while ultrasound and MRI will show any soft tissue problems including problems with tendons, ligaments or cartilage. Based on your medical history and these tests, your care provider will be able to make a diagnosis as well as recommendations for treating your knee pain that will leave you feeling as good as new. RICE – RICE stands for Rest, Ice, Compression and Elevation. If your knee pain is due to a minor acute problem, you ran too many miles or tried yoga for the first time, you may simply need to wait until the body heals itself. In the meantime, resting the knee as much as possible, icing it in 10-minute increments, using a compression device and elevating it occasionally will offer pain relief until it is healed. Remember, the knee is a complex joint that may take several weeks to heal. Chiropractic care – Not just for back and neck injuries, chiropractic care can also help alleviate knee pain. Most knee injuries are due to misplacement or misalignment of the joint. Chiropractors specialize in putting every joint in the body back into alignment. Not only does realigning the knee relieve pain, it gives the body’s nervous system an opportunity to freely communicate healing messages to damaged tissues. Multiwave Locked System (MLS) Laser Therapy – This FDA approved laser emits a high-frequency light wave that helps heal damaged cells in the body. The MLS laser is effective in healing damaged tendons and ligaments, muscle strains or sprains and degenerative joint conditions while reducing pain and inflammation in the treatment area. Most people have a positive experience after one to three treatments with the full effectiveness achieved in 12 to 24 treatments. Acupuncture – Acupuncture is an ancient medical technique that uses small needles to stimulate different parts of the body to begin the healing process. Effective in both relieving pain and helping the body heal, acupuncture takes between 15 and 20 minutes and can leave patients feeling calm and happy while experiencing less pain. Foot Levelers – Most people don’t realize that strong knee joints begin with a strong foundation. Many people who experience chronic knee pain are shocked to discover that their pain disappears when they are in the right shoes, with the right insoles. Custom-fit foot levelers provide the body with the positioning and cushioning it needs to remain in alignment as it moves while offering additional comfort to the feet, knees, and hips. Pulsed Electromagnetic Field Therapy (PEMF) – Perhaps one of the most remarkable advances in the treatment of joint pain is Pulsed Electromagnetic Field Therapy (PEMF). A series of electromagnetic pulses from a mat supercharge your body’s cells. These cells then work better than before to repair the body’s soft tissue while improving blood flow and energy absorption. PEMF has been found to be especially effective in treating old injuries that have been ignored for weeks, months or even years. Physical Therapy – People often think of physical therapy as something you do after What most don’t realize is that physical therapy can also be effective before or even instead of surgery. Physical therapists are specialists in functional movement. Not only can they successfully tell you why you are experiencing knee pain, they can also help you strengthen your body, improve your balance, reduce inflammation, and eliminate your knee pain. Surgery – Some knee injuries cannot be repaired without surgical intervention. However, surgery on its own will not leave you pain-free and ready to run again. In order for surgery to be effective, it must be matched with additional therapies that address pain, scar tissue, inflammation, and function. Even if a knee surgery of the past has left you less than pleased with your result, any of the other therapies mentioned may offer additional relief from pain or discomfort or even better strength and stability. We have said it before and it is worth saying again. If you have a sudden bout of knee pain, it is best to consult with a medical practitioner who can rule out underlying medical causes. But, sometimes your knee hurts and it’s late at night. Or your knees are talking to you after pulling a double shift. Or that half marathon left your knees stiff and sore. Since pain and inflammation go hand in hand, it is important to reduce the inflammation in the knees. The most effective way of doing this involves the RICE (Rest, Ice, Compression, Elevation) protocol. Simple, safe and easy to perform at home, icing the affected knee for 10-minute stints, using a compression bandage or sleeve to support the knee and elevating it above the level of your heart can go a long way to reducing the inflammation. If your doctor approves, taking a non-steroidal anti-inflammatory drug (NSAID) can reduce the inflammation in your knee and help you rest. There are also fantastic products on the market that rely on natural ingredients to ease aching joints. Many contain menthol, a natural ingredient found in peppermint oil that works well as an analgesic (and decongestant). These products are applied directly to the skin and work to reduce pain and inflammation as they are absorbed into the tissues below. If you are overweight and have chronic knee pain, rest may be the exact opposite of what you need. Gentle stretching and low-impact exercises such as walking, swimming or water aerobics can simultaneously help you lose weight and strengthen the muscles that are working to hold the part of your knee in place. As we said before, losing even one pound can reduce the amount of pressure on your knees by as much as four pounds. Anything you can do to further minimize the pressure on your knees will ultimately alleviate your pain. While rest may be necessary for an acute knee injury, it may also exacerbate chronic knee pain. Moderate exercise is one of the best ways to treat arthritis symptoms in the knees because it improves circulation and helps you maintain a healthy weight. If you are struggling with aches and pains in your knees, give these exercises a try. Straight leg raises – Lay on the floor with one knee bent, your foot flat on the floor. With the other leg straight and the foot flexed, raise the leg to the height of your opposite knee and lower it slowly. Repeat 10 times on each side, for three sets. This exercise strengthens the quadriceps, the muscle that keeps your kneecap in place. Standing Kick Backs – Standing straight while holding onto a chair, extend one straight leg back behind your body and return it to the starting position. Repeat 10 times each leg, for three sets. For an added challenge, step into a resistance band with both feet before beginning. Wall Sits – Wall sits work every muscle in your body, but are especially brutal on your quadriceps, hamstrings, and buttocks. Stand against a wall and move your feet forward. Slide your back down the wall until you are in a seated position. Your legs should be parallel to the ground, forming a right angle with your calves, your back straight. Hold for 20 seconds, then rest for 10 seconds and repeat three times. Gradually increase your time until you can wall sit for one minute. Step Ups – Step ups give you all of the leg muscle power without the jarring effect of box jumps. Select a box that you can step onto safely and easily. Step onto the box, then keeping your back straight and aligned over your hips, touch your right toe to the ground behind you. Repeat 10 times then switch legs. Repeat the set 3 times. When this becomes too easy, it is time to find a higher step or step down with your entire foot instead. Stationary Bike – The stationary bike is one of the best ways to improve mobility and flexibility in your knee while offering a cardiovascular workout. Start off at the lowest resistance for 10 minutes, gradually building both resistance and time. Calf Raises – Remember how your knee connects your femur, tibia, and patella? Your calf muscle plays a big part in your knee strength. Calf raises are some of the easiest exercises to do and do not require any equipment. Standing flat on the ground with your feet hip-width apart, bring your weight onto the balls of your feet, lifting your heel then lower your body back down so you are standing flat on the ground. Try doing calf raises while you brush your teeth or wait for your morning coffee. Just because knee pain is one of the most common causes of debilitating pain in the country doesn’t mean you have to deal with it on your own. 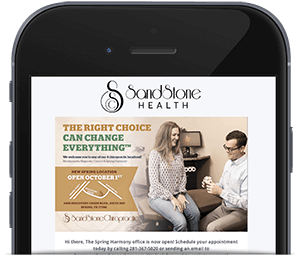 For more information on knee pain or to talk to a doctor about your knee pain, contact Sandstone Chiropractic.